The Langone/NYU Stern part-time MBA program can be completed in two to six years, with courses offered in Manhattan as well as at NYU’s Westchester campus in Purchase, NY. All part-time students participate in a mandatory two-day orientation prior to beginning the program. Students are required to take their first year of courses at one of the two campuses, but can take courses at either campus in subsequent years. Courses are offered on both weeknights and weekends. NYU notes that it is possible to complete the program by only taking courses on weekends, although this is limited to finance and management specializations at the Manhattan campus. The Langone program consists of 60 credits, 31.5 of which are core courses taken prior to elective courses or pursuing specializations. In general, full courses are worth three credits. Students may, but are not required to, pursue up to three specializations in 25 different fields such as Banking, Law and Business, Luxury Marketing, or Real Estate. In general, each specialization requires three to five courses—approximately nine credits—to complete Students may also earn course credit by participating in Stern’s Doing Business In… (DBi) programs, one- or two-week intensive abroad experiences offered between semesters. The Langone/NYU Stern part-time MBA program enrolls approximately 225 students in the fall and 200 students in the spring, including the Westchester core groups. About 41 percent of the part-time class group identifies as female, while 31 percent are of minority status. NYU Stern part-time MBA students have access to the Career Center for Working Professionals, which provides lifelong career support through individual career counseling, resume reviews and mock interviews. However, part-time students do not have access to the full-time MBA on-campus recruiting process. Stern’s part-time program costs $2,158 per credit, a total of $38,844 per year in tuition and fees for students taking six credits each semester (fall, spring, and summer). Stern estimates students will spend an additional $25,320 in room and board, $1,980 in books and supplies, $1,110 in local travel, $4,500 in miscellaneous expenses, and $218 in loan fees per year. Overall, this comes to $71,972 per year in tuition, fees, and expenses. 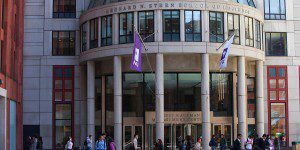 NYU Stern Part-time MBA students are eligible for scholarships in the form of donor awards once they have completed 30 credits. Donor awards are merit based and are awarded in the fall semester, typically requiring no additional application process. In January 2012, Stern began offering a Westchester Scholarship to students enrolled at the Westchester campus. One student entering in the fall term and one student entering in the spring term receive the award, which provides $10,000 towards their tuition. All applicants admitted to the Westchester campus are considered for this award. Stern Part-time MBA students who have completed at least nine credits are also eligible to apply for a teaching fellow or a graduate assistant position, earning up to $7,200 in tuition remission per semester. U.S. citizens and permanent residents applying to Stern’s part-time MBA program are eligible for federal Stafford and Graduate PLUS loans, as well as private loans. International students are eligible for private loans offered with and without a U.S. co-signer. Loans not requiring a co-signer include the UFSB Stern International Loan, offered through the First Marblehead Corporation and Union Federal Savings Bank, and the Global Students Loan, offered through the Global Student Loan Corporation to students from India. International students with a U.S. co-signer are eligible for numerous private loans up to the full cost of attendance, and are provided with a list of these options upon receiving offers of admission. There are no minimum GPA or standardized test score requirements for admission to Stern’s part-time MBA program. In addition, work experience is not required to apply, although Stern notes that most applicants have between one and 15 years of professional experience. An undergraduate degree is required to enroll in the program. Applicants to the Stern part-time MBA program must submit the online application, test scores from either the GMAT or GRE exams, a professional resume and a separate Work History Form provided by Stern on its application website. Stern also requires applicants to submit two essays, two professional recommendations, undergraduate transcripts, proof of degree, and an application fee of $250. All applicants whose native language is not English and who have not completed academic studies in an English-speaking country, or a country where English is the primary language used in education, must take the TOEFL exam and submit their scores with their applications.